I have started reading this book a few nights ago and I'm totally hooked. The Legacy Letters by Carew Papritz is one of the most unique and intriguing books. "Pa" recently separated from his wife finds out he is dying - soon. His wife finds out she is expecting twins and instead of sharing his news with her he decides to wait until she has the babies and he is passed to have her find out. During that time he writes a series of letters to his unborn children to be delivered on their 10th birthday. This is an emotional ride as you get to know "Pa" and he shares bits of wisdom written out over the year. The book only shares a portion that the children chose to be included but you get a feel for the father writing them. It is truly and interesting read. 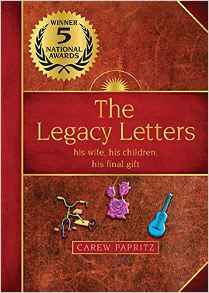 "The Legacy Letters" is told through a series of personal letters written by a father who would never live to see his children. These letters ultimately serve as the children’s practical, moral and spiritual guidebook for their entire lives as they offer bite size morsels of advice on life, love and everything in between. This would make a great gift for the person who needs a little inspiration or the book lover on your list! You can find your copy at your local book retailer or online at stores like Amazon. Visit TheLegacyLetters.com for more information. One lucky reader will win a copy of The Legacy Letters! I learned that the writer is a son of a ranger.